Nicknamed “Rafa”, Rafael Nadal has took the tennis world by storm over the past 5 years as he has made his way on the professional tennis circuit to number 2 in the world with a staggering clay-court winning streak of 60 consecutive matches. He was born June 3rd 1986 in Manacor, Mallorca to Sebastián and Ana María. He has great sporting heritage as his Uncle is former F.C. Barcelona footballer Miguel Ángel Nadal. Between 1986 and 2001 (the year in which he turned pro at only age 15) he developed a brilliant all round game playing left-handed despite being naturally right-handed.His rise since then has been a quick and exhilarating one. In 2002, he won his first ATP match at Majorca at the age of 15, defeating Ramon Delgado to become the ninth player in the Open Era to win an ATP match before his 16th birthday. One year later in 2003 he became the second-youngest player to be ranked among the world’s top 100 singles players and earned ATP Newcomer of the Year. At his Wimbledon debut, at only age 16, he became the youngest player to reach the 3rd round since 16-year-old Boris Becker in 1984 and in July 2003 he reached the Spanish championships where he lost to Lopez. He continued to improve in 2004 and by 2005 had climbed the world rankings to number 5. This made him the youngest player to make it into the Top 10 since Andrei Medvedev in 1993. During this season he won two ATP Masters Series events in Monte Carlo and Rome and managed an astonishing winning streak of 25 consecutive matches. Among his other historical achievements he became the fourth-youngest Roland Garros champion in the Open Era defeating Argentina’s Mariano Puerta in the final, the seventh player to win a Grand Slam in his first appearance at the event and the first teenager to win a Grand Slam since Pete Sampras won the 1990 US Open at age 19. During this period the intense rivalry between Nadal and Federer continued to grow reaching a climax in 2006 where Nadal beat Federer four times. First, on March 4, 2006, at the final in Dubai, where he won 2-6, 6-4, 6-4. Nadal then defeated Federer again at the Monte Carlo Masters 6-2 6-7 6-3 7-6 before meeting and beating him for a third time in this season at the finals in Rome where he won a close victory – 6-7 7-6 6-4 2-6 7-6. Their last encounter came at the finals in the French Open. Federer now sought to turn around his dismal record against Nadal, while Nadal was seeking to defend his French Open title. 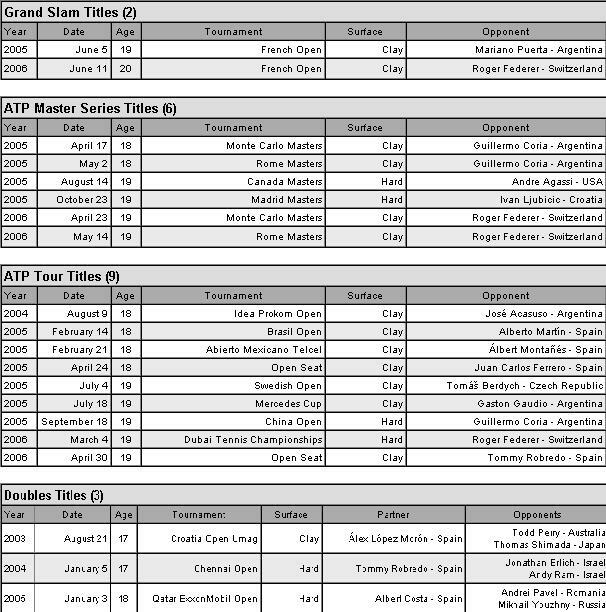 In the least competitive of their 2006 matches Nadal won a 4 set victory and will enter the next French Open with a perfect 14-0 tournament record. Checkout the ASCII Art of Rafael Nadal that can be downloaded as a text file in the below link. Please use Lucida Console font to view the art in Notepad. Before that in Notepad go to Format and Uncheck the Word Warp and then Go to Font and Reduce the Font Size to 3 to 4 pt. Use only Lucida Console Font.